The best time to mould a child (kid) is when he/she is still young. By getting the curious minds involved in something educational, there is a very good chance that they will become responsible adults. Some parents can start by teaching how to cook or baking at a young age. If the child enjoys and does well with it, then perhaps in the future, this person could become a chef. Giving a child a hobby can also teach that child how to stay focused or to pay particular attention to a certain subject. A good example of this is starting a coin collection. For most adults coins are just petty cash. They are used to buy a newspaper or used to pay for a ride on the subway etc. For children, coins are more than that. Some children save the coins placed in their piggy bank to make a special purchase or save them to use for their college tuition. To start a coin collection the parent and child can start by opening the piggy bank and examining the coins together. Coins were manufactured during different years and each has its own history. 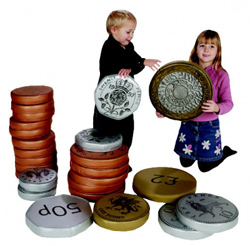 By explaining the significance of each, the child’s interest will grow and this in turn will encourage growth of the coin collection. Both the parent and child could get lucky if they should find that a coin has missing letters or numbers or a misprint is seen on the coin. Since such things don’t happen often, the value of the coin is much higher than the original face value. Coins can that are to be part of a collection should be kept inside a small box separated from the coins used for savings. When this collection has grown larger, then it is time to buy a plastic folder in which to store the coins. There are two kinds or folders currently on the market: the first can hold the coins individually and the other is a sheet which can hold a number of coins per page. By using folders the child and take the collection to school for “show and tell” and would improve the child’s self-confidence in achieving something on his own - without the help of the parents. Coins can teach the child about saving for a special purchase or project and encourage the child to work hard to achieve that goal without always asking for money from mom or dad. Coin collecting started in the early years will pay off later in life by teaching responsibility.